Jewellery is always something personal and individual. 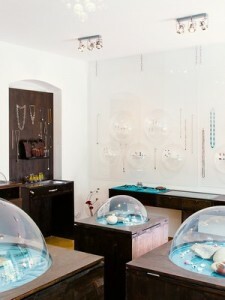 We would be delighted if everybody would find her (or his) favourite piece of jewellery at Auguste Froschhammer gallery. In best you feel more beautiful, sensual or even stronger with it. Accordingly we present an extensive and well selected choice of renowned and talented young jewellery designers and goldsmithes. Whether earrings and necklaces made of hand-cutted polyethylene, porcelain jewellery in many versions, concrete jewellery leaf gilded, lace-made jewellery or fine goldwork in classic or remarkable style: we show a wide range of contemporary jewellery. We will be happy to advise you personally. Our team – Miriam von Versen, Katrin Detmers, Britta Ehlich and and Marcel Meier – appreciates your visit at Auguste Froschhammer (Augusstraße 85 in 10117 Berlin-Mitte). Our opening hours: Tuesday to Saturday from 12 to 7 p.m. and by appointment.